I learned classical piano in the traditional way as a kid, but as soon as I could get a synthesizer and play Foreigner and Journey, I escaped. That, for me, reinforces how our method builds on traditional programs. Our philosophy is that playing music that one loves with people one loves will create a passion for a lifetime. We have 217 schools in 10 countries, and we anticipate teaching more than 30,000 students and opening about 25 new schools this year. Most of our locations are franchises. Students work toward a band performance on a real stage in student-led groups. Beyond the technical musicianship, they learn to cooperate, negotiate, and compromise; they learn courage, confidence, intuition, and presence. What excites us is that those skills are transferable to everything—from a classroom to a boardroom, operating room, or trading floor. 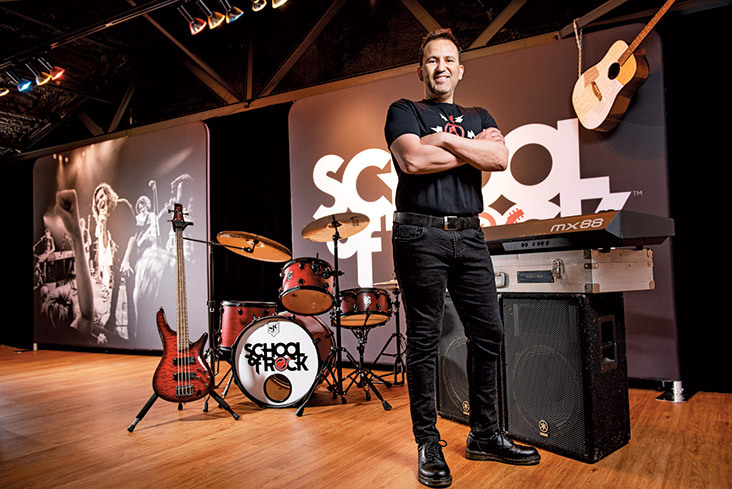 In many ways the challenges at School of Rock are the same as other enterprises: taking a strong brand and making it stronger. What’s very different here is that the concept is fueled by passion more than almost any other brand. About 10 years ago, my family started a garage band called Full Price. We recorded an album, the real heart and soul of which was a song inspired by the story of a girl who perished in the earthquake in Haiti. Seeing how the music affected my whole family, it revealed to me how important it is for music to be a language everyone speaks. So when I had the opportunity to join School of Rock last year and do this as a career, it seemed as if fate was smiling on me. The strumming of a guitar, the vibration of a vocal cord, and doing it all together, with eye contact, to the same beat, in the same key—that’s really very special. People find it euphoric to play music together, but it’s becoming harder to find this feeling than it used to be, because one of the byproducts of technology is an epidemic of passive numbness. I think our experience begs a question for other brands and concepts: How do you create a counterpoint to the dull hum of the rest of consumer experience?